Is the Easyology Jumbo Cat Litter Mat is right for you? In this review, we’ll cover all the features- including pros and cons. Plus, we’ll learn how it compares to other Easyology litter mats! As a fellow cat parent (of multiple cats, actually), I know how important it is to keep the litter box area clean. After all, no one likes stepping on gritty, gross litter that gets tracked all over the house, right? Read on to check out my Jumbo Size Easyology Premium Cat Litter Mat review to see if it’s the right fit for you! This post contains affiliate links. If you make a purchase through these links, we earn a small commission at no extra charge to you. Photos courtesy of Easyology. Let’s be honest here: litter boxes are probably the only downside to owning a cat (or being owned by one, as the case usually is). Everything about them is just gross, from the gritty litter to the stinky odors that emanate from them! While we can’t get rid of them entirely, we can at least make sure that bits of litter don’t make their way all over our house. That’s where a litter mat comes in! In this case, the Easyology Jumbo Cat Litter Mat! Let’s start with the basic features, then we’ll talk pros and cons. I know what you’re thinking: it’s a rug. How many features can it possibly have? If it was as simple as just buying a carpet and popping it under your litter box, you wouldn’t be looking for an Easyology Jumbo Cat Litter Mat review, now would you? I’ve gone the “piece of carpet” route. I’ve also gone the puppy pad route (surround your litter box with them). While both work so-so, they have many drawbacks, too. For example, puppy pads work great for litter box misses but don’t really stay in place, and they’re oddly expensive! 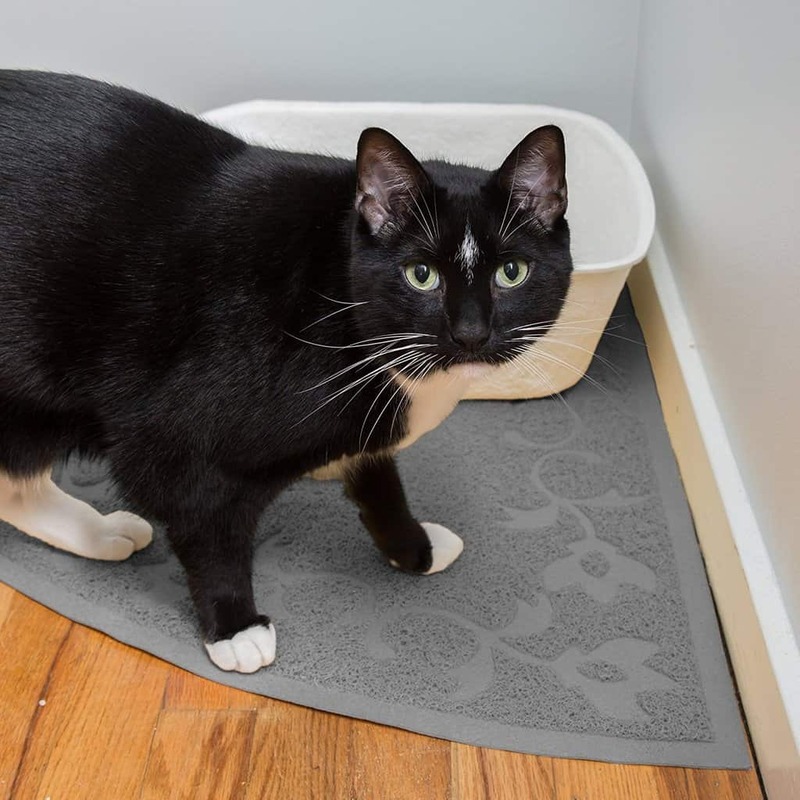 The Jumbo Size Easyology Premium Cat Litter Mat looks like a carpet, but it’s actually much more than that. At 47” x 36”, it’s the largest cat litter mat available on Amazon, and is actually big enough for two boxes. Gentle on your cat’s feet, yet still effective at trapping litter. It’s Phthalate-free (don’t ask me how to say that word), meaning it’s safe and non-toxic for your cat and your family. The extra-thick material keeps it from tearing. Patented groove design traps up to 37% more litter than other mats, according to their own claims. Natural rubber backing keeps it from sliding all over the place. Comes with a 100% Satisfaction money-back guarantee. While these are all great features, some are more important than others to me. When I choose a litter box mat, I need something that’s easy to clean, big enough for my two boxes, and, most important, safe! Let’s break these features down a bit more and look at the pros and cons. 3. Your cat may be afraid of it! The Easyology Jumbo Cat Litter Mat is, for the most part, very easy to clean for most cat parents with cats who don’t miss the box. Any of these cleaning methods will work very well at removing the stray litter. For those who live in apartments and don’t really want to drag a stinky mat through their building, I suggest putting it in a garbage bag to take it outside. 2. It really is Jumbo! I have three cats (we used to have 5 but lost two last year to age) and typically have two boxes going. I really don’t like the idea of spending $30+ each on multiple mats, so the fact that this one can actually fit under two boxes is a huge plus. It’s also big enough that there is enough “lead room” for your cat to really get that extra litter off their paws as they’re leaving the box. This is probably among the most important pros! As mentioned above, the mat is Phthalate-free. It’s also BPA-free. Both of these things mean that it’s non-toxic for your cat and your family. 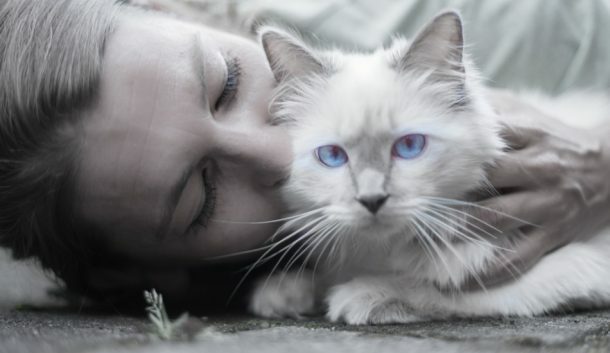 Considering that your cat often licks their paws to bathe, I don’t want anything toxic touching those toes! Honestly, I don’t really care if it’s pretty. I mean, I’ve used plain old ugly puppy pads before, so style isn’t an issue. Besides, my litter boxes are in my laundry room, out of sight most of the time. Sadly, that means it doesn’t really do a good job at absorbing urine from complete misses. While my current cats are pretty good at keeping their pee in the box, I had an elderly cat that missed the box entirely, peeing totally just outside of it. One remedy to this would be to put puppy pads under the mat to protect your floor from accidents. Since it’s water-resistant, it will catch minor misses pretty well. This isn’t really a flaw in the design or the mat itself, but it’s still a factor. 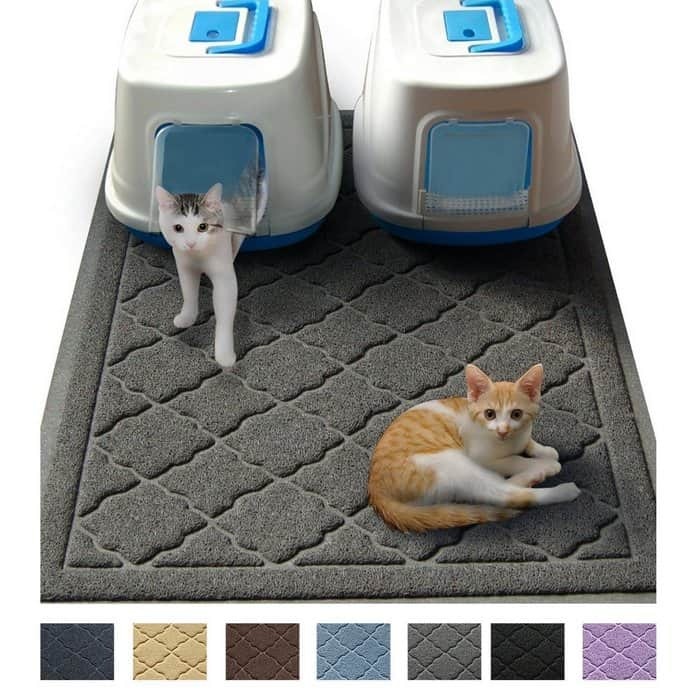 No one wants to pay $30+ for a litter mat only to find that their cats won’t go anywhere near it. If you have a particularly skitzy cat, I suggest using a cheap piece of carpet first to make sure your kitty will walk on it. If they pass the cheap test, then move on to the Easyology Cat Litter Mat. 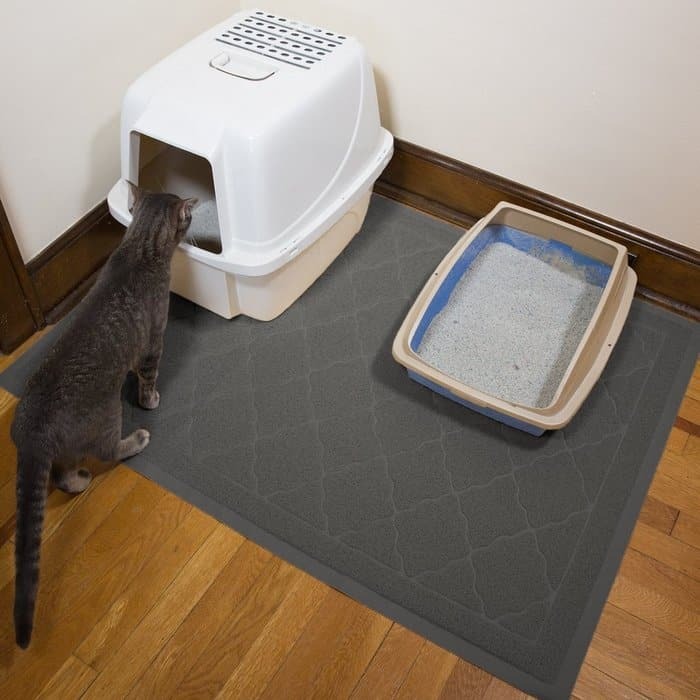 How does it compare to other Easyology Litter Box Mats? 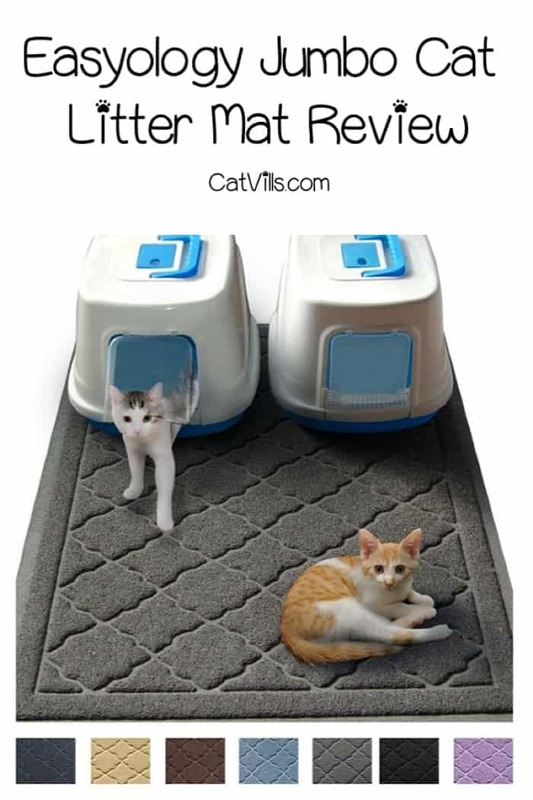 While the jumbo mat is my top choice, Easyology does offer two other litter box mat options. Let’s take a look and see how they compare. If you don’t need a mat large enough to fit two boxes, or don’t really have space for a nearly 4″ by 3″ mat, this is a good alternative. The Easyology XL Super Size mat is 35 x 23, so it’s not exactly tiny. Length-wise, it’s only about an inch shorter than the jumbo. It’s about half the width, though, making it ideal for skinnier spaces. Comes in a few more colors than the jumbo mat. 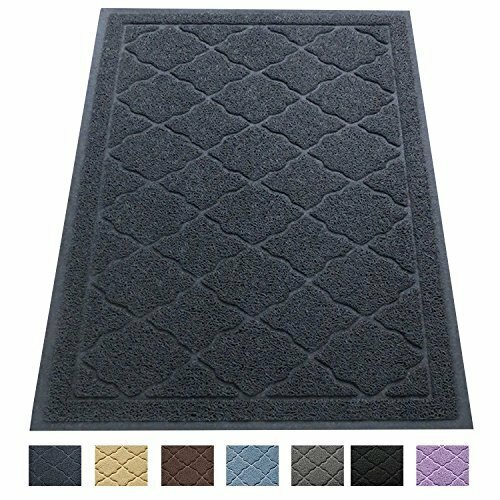 This is a great option for those who love the Easyology jumbo mat but don’t really have the space. Other than size and colors, it’s has the same exact features as the jumbo mat. Again, the basic features of this litter mat are the same as the two above. However, its size and shape make it a good option for those with very little space. If you have two boxes close together or just want to cover a wider area around your box, go with the Easyology Jumbo Cat Litter Mat. If you have two boxes that aren’t close together, I’d get two of the XL (which would be about the same price as one jumbo). For just one box, go with the XL. If you’re super tight on space, go with the corner mat. Buy the Jumbo Cat Litter Mat Here! Do you have any of the Easyology mats? What would you add to my Easyology Jumbo Cat Litter Mat review? Share below! The liter mat is such a great idea! Can’t wait to share this with others! I got one for our cat and it made a world of difference for how much litter was getting bounced around the house on her paws. I love it and highly recommend.